But black women are speaking out and fighting back. Bill O’Reilly’s tasteless, racist, and sexist joke about Maxine Waters’s appearance wasn’t the first time America has encountered a white onlooker inspecting and commenting on the body of a black woman. And it probably won’t be the last. But the pushback to O’Reilly—by Waters herself and by black feminists on social media—is a powerful sign that white commentators aren’t the only ones with power any more. In case you missed it: On Tuesday morning, four TV personalities sat on a couch and discussed the day’s news on Fox & Friends. Their jaunty back-and-forth led one, Bill O’Reilly, to invoke the name of Maxine Waters, the senior black representative in Congress from California. O’Reilly liked how “angry” Waters made people, he told the couch, and he wanted “more” of it. “I’m so glad you asked,” one of the show’s hosts said. With a giant grin on her face, she tossed to a clip of Waters on the House floor speaking about President Trump. 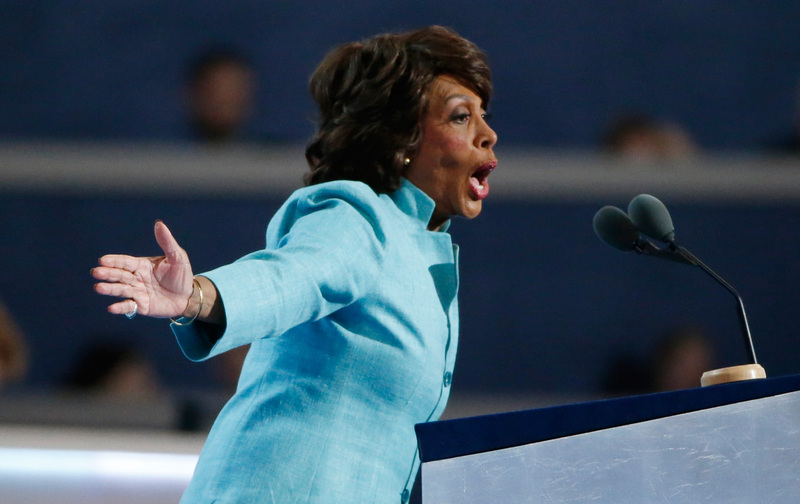 “We have suffered discrimination,” Waters says, “We’ve suffered isolation.” Then suddenly the screen splits; on one side appears O’Reilly, who is mocking Waters, and on the other side is Waters, still on the House floor talking about her patriotism in the face of a hostile administration. Fox cuts away from Waters, and we’re back on the couch. “I didn’t hear a word she said,” O’Reilly jeers, “I was looking at the James Brown wig.” His couch mates laugh in the background. Later in the day, after a social-media outcry denounced O’Reilly’s comments as racist and sexist, he apologized for his “jest,” calling it “stupid.” Indeed, O’Reilly’s remarks were dumb, racist, and sexist, but it should be noted too, that this kind of behavior has a long history. It was a prerequisite, for example, when black women were brought, forcibly, to this country. During slavery, black women were placed on auction blocks to be looked at and evaluated for potential sale. They were often poked and prodded, sometimes they were stripped. “The auction was often a government-sponsored event, taking place on the courthouse steps,” wrote University of Pennsylvania professor Dorothy Roberts in her book Killing the Black Body. From the beginning, white men were given free rein to scrutinize the black woman’s body. It was on the courthouse steps; it was institutional. The end of slavery didn’t stop white America from commenting on black women’s bodies, either. It happens now, though we are more than 150 years out of slavery. Take, for example, when Michelle Obama was criticized for showing her bare arms on the cover of Vogue back in 2009. She was called “inappropriate,” and her arms were labeled “muscular,” as if that were a bad and unfeminine thing. Sometimes the gaze of powerful white men on black women has resulted in institutional discrimination: Last year, a federal judge ruled that it was OK for companies to fire employees for having dreadlocks. The US Army didn’t approve dreadlocks until earlier this year. While the practice of whites commenting on and making decisions about the bodies of black women is certainly rooted in slavery, there are important distinctions to be made between then and now. For one, visible black women like Waters can speak out against those who disparage her appearance, and she has support and an audience. “I’m a strong black woman. I cannot be intimidated. I cannot be undermined. I cannot be thought to be afraid of Bill O’Reilly or anybody,” she told Chris Hayes on MSNBC. The scores of black women who have made the hashtag #BlackWomenAtWork go viral in response to O’Reilly’s comments are also seeking to be heard. Brittany Packnett, a prominent activist and vice president of National Community Alliances at Teach for America started the hashtag as a way for black women to talk about workplace discrimination. And this isn’t the first time black women have taken to Twitter en masse: Just last week there was #MissingDCgirls, which raised awareness about the alarming number of black girls who go missing in Washington DC; last year, #SayHerName took off, a campaign to remember the black women who succumbed to police violence. When Hillary Clinton accepted the nomination to be the first woman presidential nominee, black women took to twitter with the hashtag #blackwomendidthat, at first to commemorate Shirley Chisholm, a black woman who ran for president in 1972. Ironically, on the same day O’Reilly maligned Waters on Fox, two black women filed a lawsuit alleging racial discrimination against that very company. Comments, like the one O’Reilly made about Waters, are situated in America’s racist history, and black women still feeling the impact of that history, but I am hopeful about the ways in which we are fighting back.